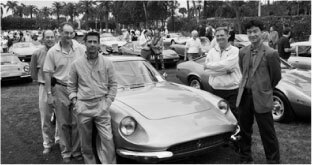 My Online Resource that covers all things "Vintage Ferrari!" 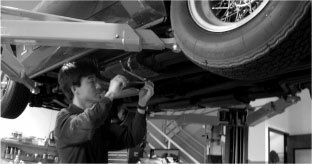 A collection of Ferrari restoration tips with links to details on each specific part. 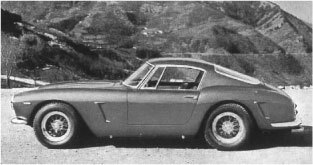 There were basically three versions of the approximately 955 250GTEs made between 1960-1963 all fitted with a 3.0 liter V-12 engine. The last 50 cars of this production run were fitted with 4 liter V-12s and were designated "330 America." I'm not exactly sure how the 7 preproduction GTEs fit into the total 955 GTEs built, but the information I have here is gathered from a number of sources, so please excuse the discrepancies. If you have any corrections or additions to the information, please feel free to e-mail me! One of the great things about posting this site is the amount of Ferrari fans I've met. A lot of you have shared your experiences with me, and I have found them extremely entertaining. E-mail your story to me, and I will post them to this area, so we can share in the trials and triumphs of all things Ferrari, automotive, or mechanical! Here are some of the Ferraris fellow enthusiasts have submitted. If you would like your car to be included in this gallery, e-mail me with the information and a couple of pictures. I am not only interested in the story behind your car, but also how you became interested in the Marque. We'd love to hear your story! This image shows a basic timeline of Ferrari.